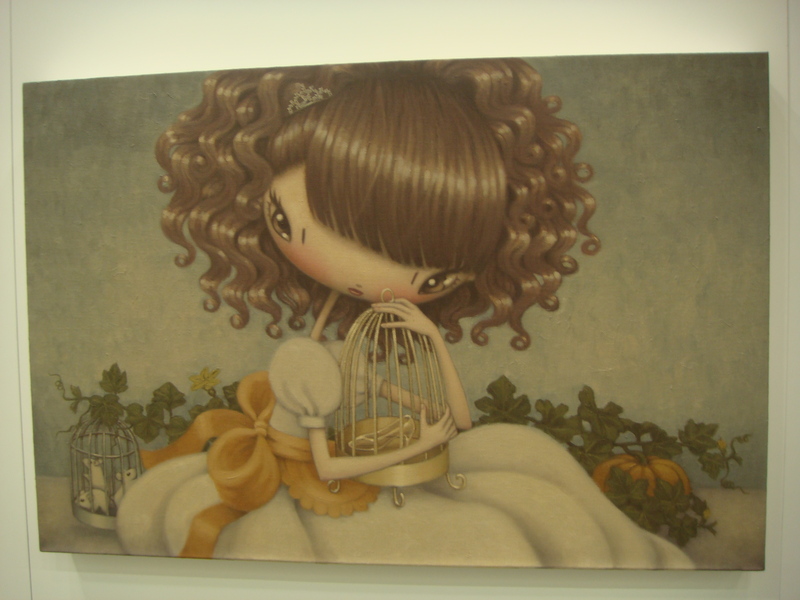 The final post on Art HK 10 features a series of paintings that are both cute and eerie, which is a surprisingly powerful combination. When I first passed them, I thought it was just another picture of a cute anime girl with a really big head. But then I did a double take as I noticed odd little things that I didn’t expect to be there. First it was pills as toppings on a sundae. 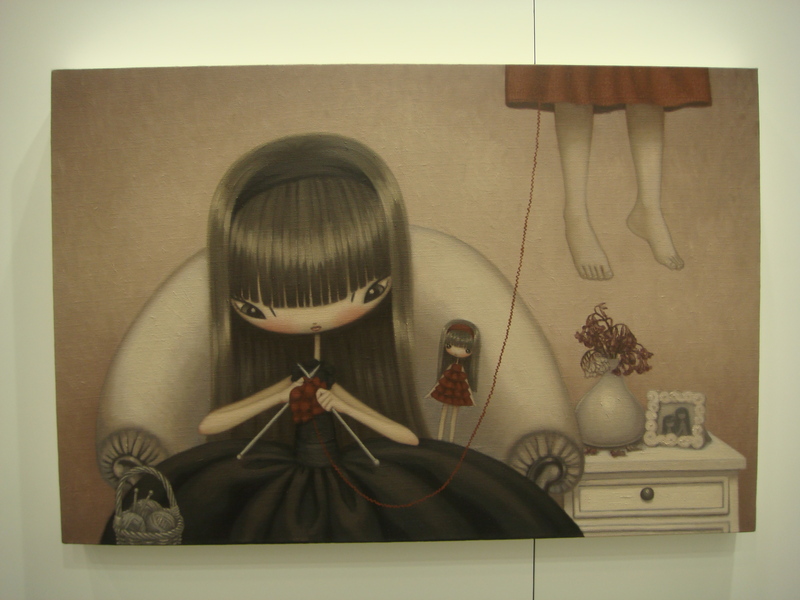 Then it was a girl knitting a dress for her doll from the wool of the dress of a lifeless unseen form hanging above her. How incredibly creepy is that? Innocent everyday scenes suddenly took on a new meaning! There was even a fairy tale themed series that was interesting since it provided another perspective to the classics. A little bit like Gregory Maguire books which totally changed my perspective of Cinderella and the Wizard of Oz forever. 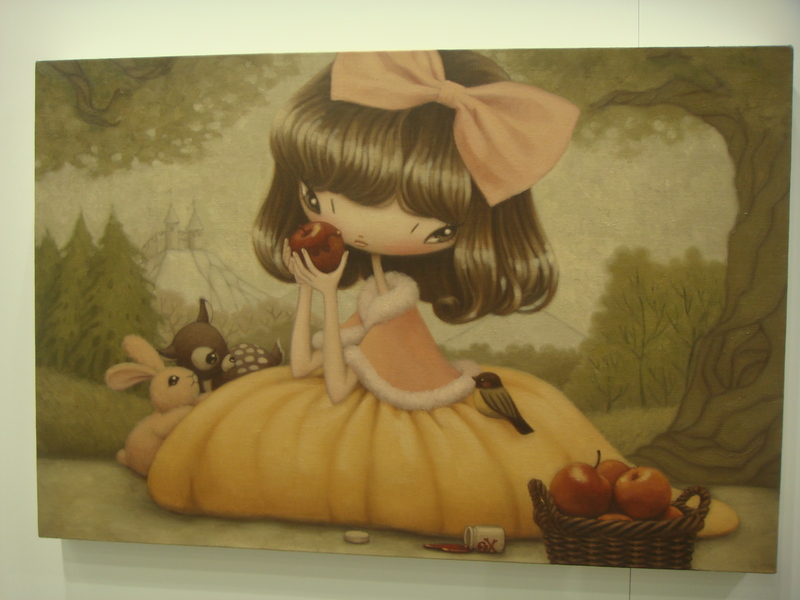 There was Snow White and her poisoned apples. It seems to be suggesting that she poisoned herself. Notice the little can of spilled arsenal on the ground? The same was going on for Sleeping Beauty and the poisonous needle point. Then there was Cinderella, where she has trapped all the things that had helped set her free i.e. the mice and the glass slipper. It seems as if in each case they’re inflicting pain upon themselves instead of being victimized by others. I haven’t quite figured out what message the paintings are trying to convey yet, but it is all very ominous and thought provoking. It makes one just want to stare and wonder. Ps. There’s nothing quite like procrastination to keep the blogs coming. Good luck to all CFA candidates this weekend! Oh! I love creepy beautiful art. Do you know who the artist is? Unfortunately I forgot to note down the artist. I only remember it was Sang or Sung something, which I know is not very helpful at all.